Here are the key factors when choosing a business broadband provider that matter. Let’s cover these in more detail. Not all broadband packages are equal. You can get ultra low-cost broadband for pennies a month but there is a price to pay when it comes down the speed of the service. 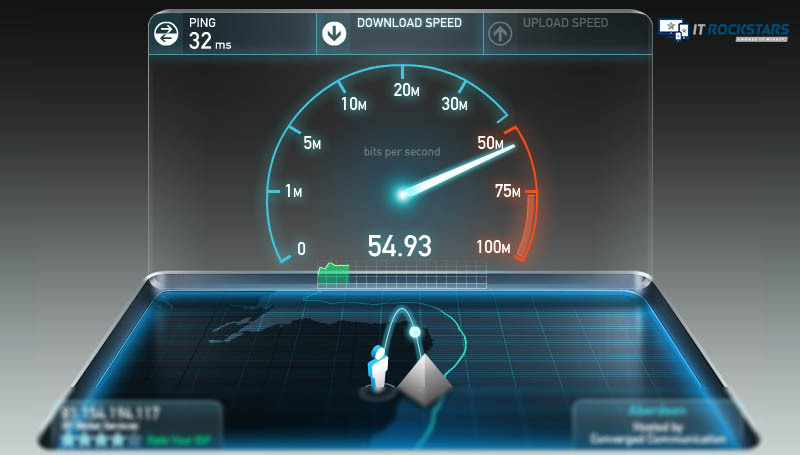 The test includes your ping time, upload and download speed. However, it does not give you the important figure which is contention ratio. If you want business grade broadband you have to get contention ratio correct. It is important because you will be sharing the same data pipe with other companies locally. If you are on a cheaper broadband package you will be sharing with residential users. This can have a big effect on broadband speeds at certain times of the day. When kids come home from school and hook up to youtube & xbox your speed will become noticeably slower. The other factor that comes into play with the speed are how many users will be connected and what types of work are they doing. If it’s purely office based admin between a few members of staff a standard ADSL connection will suffice. If things change when you move up to 5+ users and if things like streaming media – audio & video come into play. You would be better off with a super fast connection in the form of FTTC (Fibre to the cabinet). Has your broadband connection ever stopped working, the problem with the modem or problem on the line? There’s only one way to find out call either the IT company and get them to sort or call the ISP call centre. Most would opt to call the IT provider if it’s under their remit, but the IT provider usually just has to jump through the same hoops and call the ISP. If you’ve ever had the pleasure of phoning an ISP support desk – you know how much of a hassle it can be, the bigger the ISP (BT) the worse the support. The answer to this is to have your internet connection under the same service as your IT provider, once helpdesk, one bill and with local support if things go wrong. Network hardware comes in all shapes and sizes. When you sign up for a broadband connection you usually get a standard modem/router with WiFi all built into one device. These are great for home users but if you have multiple users to support in an office based environment you want to make sure your not only getting a fantastic speed from the internet service on the external WAN (wide area network) but also a great service on the LAN (local area network) this calls for quality network hardware. Internet connectivity is almost like the oxygen for business if you skimp on network hardware it’s simply a false economy. We aim to provide real value network hardware that does not cost the earth. If you would like further information on the type of Internet service and network hardware we recommend please contact us.